August 2011 -- Tom Clausen received the prestigious Knight of Sight Fellowship at the district's first cabinet meeting. The fellowship was presented to Lion Tom by an anonymous donor for his continued support of the district's information technology. 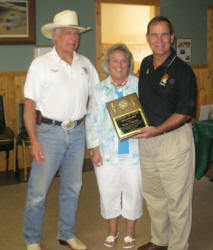 Presenting the award is PDG Tom King who is the president of the Lions Eye Bank of Wisconsin and Lion Betty Clausen. Lions transport eyes and process corneas at the Lions Eye Bank of Wisconsin. The Knight of Sight is awarded by the Lions Eye Bank of Wisconsin Lions upon receipt of a $1,000 donation by an individual to the Eye Bank. Tom has been a member of the cabinet since 1992. Other FDL Evening Lions that are Knight of Sight Fellows are Orv Doede (deceased), a past president of the Eye Bank, Frank Bartzen, Gary Colton and Erv Karls.